Voltaire is a chic champagne bar located in the vaults of the Crowne Plaza, London. This Spring, Voltaire welcomes three food truck residencies, bringing London street food culture to the Square Mile. First up on the bill is The Cheese Truck. These guys are a regular at Maltby Street Market, and a firm favourite of mine. They leave their yellow truck behind and enter the Voltaire kitchen to showcase the best of British cheese by packing the gooey goodness into a grilled sandwich. The Cropwell Bishop Stilton with sweet-cure bacon & pear chutney is a must-try. Ensure your napkin is at hand to catch any escaping stilton. The Cheese Truck is set to open their full time Cheese Bar in Deptford soon, so keep those eyes peeled. From 15 April – 1 May 2015, head down to the vaults to sample the delights of Bill or Beak. A refreshingly original choice of either spiced shredded duck or chicken (bill or beak) served up in a hand-crafted burger. The shredded duck and pork burger is marinated in a deliciously blended sweet, spiced marinade. 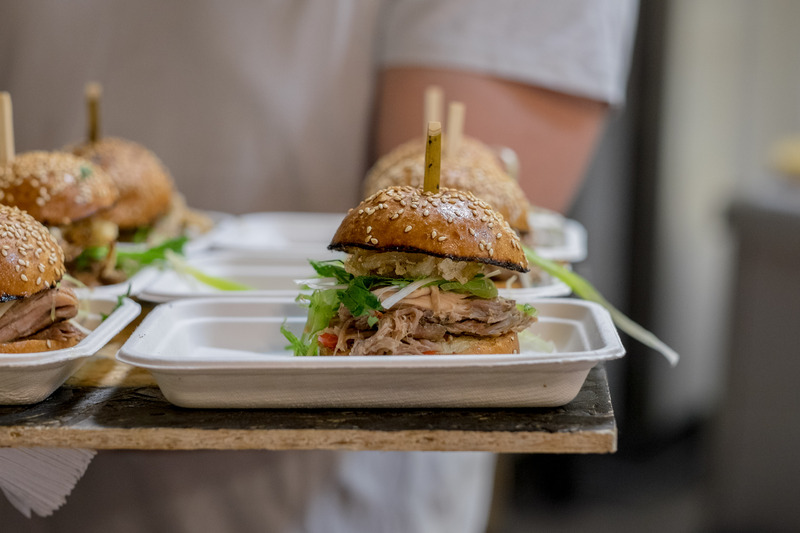 The shredded meat is served in a brioche bun topped with spring onions, coriander, mint and a Vietnamese dressing. Randy’s Wing Bar will be joining Voltaire from 6 May – 22 May, bringing with them their mouth-watering American influenced chicken wings. Try Randy’s Asian Wings sprinkled with crushed fried peanuts and toasted sesame seeds, paired with a tall glass of Pommery’s Springtime Brut Rosé Champagne. A street-food menu in a champagne bar might be the less-than-obvious choice, but trust me – it works. In the Square Mile booking tables is still the norm, so take advantage! I recommend a room in the heated outdoor vaults.